NOSE: The hops hit you first. They smell unincorporated…like the bartender just tossed a handful of hop plugs on top of the beer. Mostly pine resin and ganja that give way to a whiff of bitter, roasted malt and some caramel. Not a well-balanced nose at all…smells like a novice homebrew experiment. TASTE: Malt up front…less sweet than roasted. The middle has a pleasant peppery, rye spice, but the finish is all bitterness and astringency from the hops and booze. Would have liked a more substantial malt backbone and some more rye character. Some nice ideas here, but needs work. MOUTHFEEL: Medium bodied with slightly below average carbonation. DRINKABILITY: This brew was specially made by Tommyknocker to commemorate the success of the Free the Hops movement in Alabama. I didn’t love the brew…it’s a bit of a mess. But I absolutely appreciate Tommyknocker taking the time to memorialize an important milestone in Alabama’s continuing efforts to end the absurd beer restrictions that plague the state. Anything that makes people realize that Alabama still has a ton of work to be done if the craft brewing movement is ever going to catch on here is a good thing in my mind. 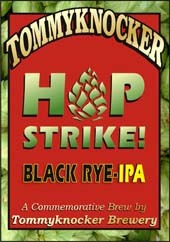 Posted in Tasting Notes.Tagged Alabama, Free the Hops, Hop Strike!, J. Clyde, Tommyknocker.